This is huge news for the audio industry. The multi-room music maestro and architectural speaker specialist Sonance have announced a new range of in-wall, in-ceiling and waterproof outdoor speakers. The ‘Sonos Architectural by Sonance’ are designed and ‘optimized’ for the Sonos Amp , which launched in the US in August and has not become available to SA market just as yet. 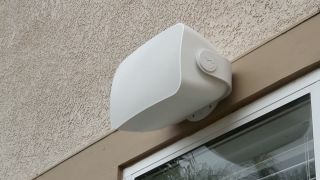 The Outdoor speaker see Sonos bringing hardware outside of the home for the first time, and naturally has a weatherproof design that allows owners to, say, fix them to the outside of their house or place them in their garden. According to Sonos, they are engineered to withstand humidity, water, salt spray, heat, UV rays, and freezing temperatures. One Sonos Amp can connect with up to three pairs of the new speakers, also gifting them Sonos functionality such as streaming service access via the app and AirPlay 2 control. When connected to the Amp, the in-ceiling and in-wall speakers can activate Trueplay calibration software, which measures the size, construction, and furnishings of the room in which the speakers are placed, and automatically adjusts the EQ for optimal sound. They also feature specially designed round, or optional square, grilles that can be painted to match the wall or ceiling. “Our goal was to create a solution optimized for installers, bringing the Sonos experience to architectural speakers for the first time,” said Sonos CEO Patrick Spence. This entry was posted in Blog and tagged Sonos.